This map shows the regions of visibility for Orbital ATK's Antares rocket nighttime launch scheduled for 8:03 p.m. EDT on Sunday, Oct. 16, 2016 from Wallops Island, Virginia. The launch may be visible from a wide region of the U.S. East Coast. Color bands denote the time after launch (in seconds) the rocket's plume may be visible. 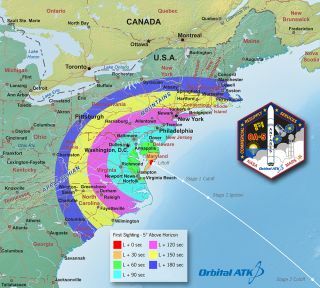 A private rocket launch from Virginia's Eastern Shore on Monday onight (Oct. 17) could be visible to potentially millions of skywatchers along the U.S. East Coast, weather permitting. Observers who live near and along the Atlantic Seaboard, west to the Ohio Valley and the eastern Great Lakes have a great opportunity to see the launch. A two-stage Antares rocket developed by Orbital ATK will loft an uncrewed Cygnus cargo ship into orbit at 7:40 p.m. EDT on Monday night. The rocket will launch from Pad 0A of the Mid-Atlantic Regional Spaceport (MARS) located on Wallops Island, Virginia. You can watch a webcast of the launch here beginning at about 6 p.m. EDT (2200 GMT), courtesy of NASA TV. This flight, called CRS OA-5, will be the seventh planned flight of the Orbital Sciences' uncrewed resupply spacecraft Cygnus and the vessel's sixth flight to the International Space Station (ISS) under a commercial resupply services contract with NASA. To reach the station, Antares must be launched when Earth's rotation carries the launch pad into the plane of the station's orbit. That comes at 7:40 p.m. EDT (2340 Oct. 18 GMT) on Monday. The launch flight path, however, is noticeably different from the ISS resupply missions launched from Cape Canaveral, Florida. Those launches originating from Florida's Space Coast in Cape Canaveral, bring the path of the resupply cargo craft nearly parallel to the U.S. East Coast. But in the case of Antares, the launch trajectory will be toward the southeast and on a course directly away from the U.S. mainland. Friday's long-awaited return of Antares will take place nearly two years after Orbital ATK's CRS-3 mission failed (on Oct. 28, 2014). In that launch, the Antares rocket exploded just seconds after liftoff. Orbital ATK traced the problem to the first-stage engines used in the rocket at the time, and those have since been replaced. In the meantime, the company also launched two Cygnus missions using Atlas V rockets built by the company United Launch Alliance. The Cygnus spacecraft for this mission is named the SS Alan Poindexter in honor or astronaut Alan G. Poindexter, a space shuttle commander who died in a 2012 water sports accident. Provided here is a map courtesy of Orbital ATK. The map below show the rough time at which you can first expect to see Antares after it is launched. It represents the time at which the rocket will reach 5 degrees above the horizon, which varies depending on your location. This Orbital ATK map shows the maximum elevation (degrees above the horizon) that the Antares rocket will reach during its first stage burn. The maximum elevation depends on your location; the further away you are from the launch site, the closer to the horizon the rocket will be. Five degrees was chosen as the cutoff, since it's unlikely that you'll be able to view the rocket when it is below 5 degrees, due to the presence of buildings, vegetation and other terrain features. As an example, for an observer in Annapolis, Maryland, this map shows that Antares will reach 5 degrees above the horizon approximately 120 seconds after launch (T+ 120 sec). The first stage uses kerosene and liquid oxygen as propellants. Cygnus will be launched into orbit using Orbital ATK's upgraded Antares 230 launch vehicle. The Antares 230 vehicle features all-new RD-181 engines. Antares should appear as a bright, moving star. Editor's note: If you capture a stunning photo of Orbital ATK's nighttime launch and would like to share it with Space.com for a story or gallery, you can send images and comments in to spacephotos@space.com. Observers who use binoculars might also be able to see a short contrail. Because the first stage of Antares is liquid fueled, its ascent is actually slowerthan the solid-fuel Minotaur rockets that have launched from Wallops in past years. Antares will jettison its first stage once, about 208 seconds after launch. This piece harmlessly breaks up in the atmosphere and falls into the Atlantic Ocean. Then comes a coasting phase after the first-stage shutdown. The second stage is a solid-fuel rocket, the Castor 30. This stage, along with the Cygnus spacecraft, is put into a low-Earth orbit. Once it separates from the second stage, Cygnus will then use its own engines to continue on its mission to the space station. Should Thursday's launch be scrubbed, Antares liftoff time will occur approximately 22 to 23 minutes earlier per day. If, for example, the launch is scrubbed on Friday, liftoff on Saturday will be 8:28:45 p.m. EDT. Each day, the launch window lasts for exactly 5 minutes. NASA's Wallops Flight Facility Visitor Center and grounds will be open to support the viewing of the Orbital ATK commercial resupply flight. The Visitor Center is located approximately 4 miles (6 kilometers) from Wallops Island with a clear view of Pad 0A. Limited parking and seating are available on a first come, first serve basis. Arrive early to ensure a space. Live launch coverage of the Orbital ATK resupply mission to the International Space Station will begin at 8:15 p.m. EDT on NASA Television and the agency's website. See: http://www.nasa.gov/nasatv, and will be carried live on Space.com here, courtesy of NASA TV. NOTE: Keep in mind that the video webcast of the launch is sometimes delayed by up to one minute. Android users have the option of downloading the "What's Up at Wallops" app, which contains information on the launch as well as a compass showing the precise direction for launch viewing. The app is available for download here. Joe Rao serves as an instructor and guest lecturer at New York's Hayden Planetarium. He writes about astronomy for Natural History magazine, the Farmer's Almanac and other publications, and he is also an on-camera meteorologist for News 12 Westchester, N.Y. Follow us @Spacedotcom and Facebook. Original article on Space.com.